When I saw the original photo of this lovely chestnut draft horse, I was, of course, drawn to the texture of his mane. And this challenge, with the opportunity to play around with color, was a perfect chance to let loose. Participating in the challenges with the eight other artists in this group over the past year and a half has been a wonderful experience and I will watch your progress in the coming year with great interest. Play on! 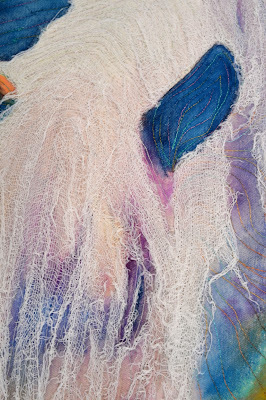 Beautiful rendition Mary and the cheesecloth is so good for the mane. We will miss you. Please keep in touch. Oh my gosh.... this is fabulous!! WOW! Beautiful. 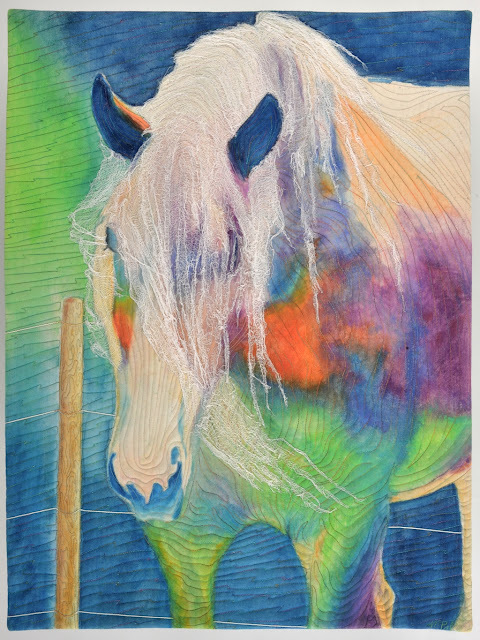 I love the use of cheesecloth for the mane. Ah, Mary, just lovely! So interesting to see what new things you will interpret with cheesecloth. It works so beautifully here! We'll miss your insightful discussions and beautiful/thought provoking responses to our challenges. All the best until next time :) Houston? "That's a horse of a different color...." GORGEOUS! I have so enjoyed your responses to the challenges put forward by this very eclectic group over the past 18 months. I can't get to Houston this year...April in VA? Hope to see you. Wow! This is the most beautiful horse I've ever seen! I love this piece so much, Mary. It's very very beautiful. I will share this wonderful work with my students and tell them it's made by you!